High quality staff are the greatest asset of Flexible Learning Programs (FLPs) (Te Riele, 2014; Thomson & Pennacchia, 2014), central to their students’ educational experiences and outcomes. FLPs are characterised by a shared vision of offering inclusive educational pathways for young people who, for varied reasons, are disengaged from or have sought alternatives to traditional schooling models (Mills & McGregor, 2014; Te Riele, 2007, 2014; Thomson, 2014). They require educators to work differently from common approaches adopted in many mainstream settings, and taught in many pre-service qualifications (Mills & McGregor, 2014; Morgan et al., 2014; Te Riele, 2014) highlighting the need for relevant in-service learning opportunities. Professional learning (PL) is a major lever for enhancing staff quality in schools and assisting staff to become more successful in their work with students (AITSL, 2012; Cole 2012; Desimone, 2009; Timperley, 2011a). At the end of 2014, participants in a forum for staff working in flexible learning settings were asked: "Do you feel there is enough PD [Professional Development] focused on flexible learning?". Without exception, the participants responded ‘no’. This mirrors comments we have heard across many FLPs around Australia over many years. Yet, very little research exists into their PL experience. Listening to FLP staff, and taking their concerns seriously, was the impetus for the project this report addresses. 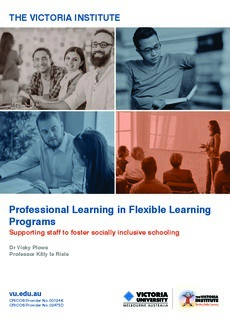 The research, conducted during 2015, aimed to develop an understanding of the PL opportunities, experiences and needs of staff in FLPs in Victoria in order to better support the PL of staff in FLPs as well as to advance an understanding of PL for socially inclusive schooling more broadly.